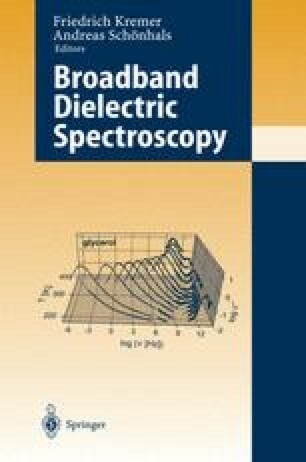 Nowadays dielectric relaxation measurements can be carried out almost routinely in broad frequency ranges continuously covering ten to fifteen decades and more [1. This allows one to track the time scale on which dipolar motions occur in a wide temperature interval and to investigate in detail the shape of permittivity and dielectric loss spectra. Early on it has become clear that at a given temperature and pressure the molecular motion in most dielectric materials cannot be characterized by a unique time constant. In order to describe the experimentally observed relaxations intrinsic non-exponential as well as distributed processes have been considered. For a long time the distribution concept was quite popular in the description of dielectric phenomena [2–. It was often based on the assumption that environments differing from site to site lead to locally varying time constants. However, the alternative option which starts from the consideration of nonexponential responses  has also gained considerable attention –. To justify these approaches theoretically it has been pointed out that the interactions which exist between dipolar molecules should render a description in terms of a simple distribution of relaxation times at least questionable.